new entertainment and media outlook from PricewaterhouseCoopers. fall 16.3% short of its level in 2007, the pre-recession peak. The unfortunate fact is, overheads are killing the news industry as new more skeletal structures are out competing them by producing more content for cheaper. 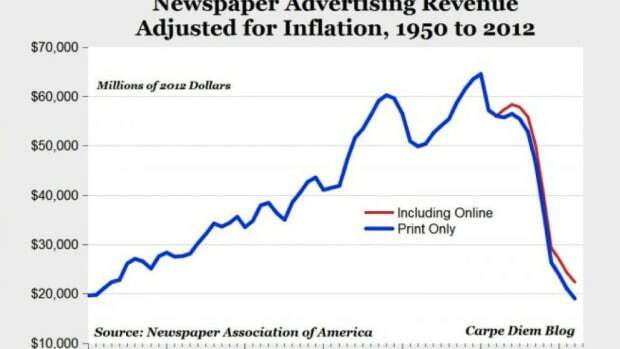 Traditional news just isn&apos;t profitable - not that there is anything wrong with that, but it is down to the industry to get creative on how it funds proper journalism. There are a number of options including pay walls (not necessarily such a bad thing from the perspective of a struggling journalist), voluntary subscription payments and partnerships with merchant sites. It isn&apos;t all gloom and doom, but it still isn&apos;t great for anyone looking to have a serious career in traditional journalism.